The Danish understand their craft including fashion, interior and architecture design and they therefore concentrate on simple and also sophisticated design. Denmark is known as creative smithy since the 50s and 60s, a time of flash-backs, also known as “Danish Modern”, being always growing up timeless design talents since then. The design approach of the Danish modern is thereby based on the cognitions of the anthropometry, which teaches how to measure the human body, which should influence the design of Danish modernity back then. Iconic designs of famous names like Arne Jacobson, Hans Wegner and Børge Mogensen today belong to the absolute classics. 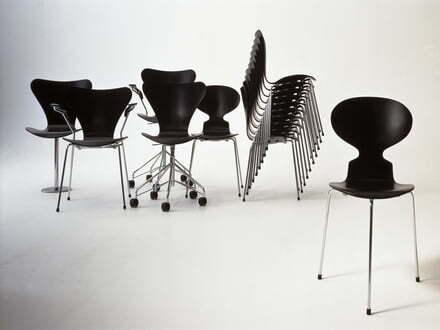 Designs, like the “Ant” or the Panton Chair made by the Danish architects and designers Arne Jacobsen and Verner Panton, convince by their very ergonomic shapes. Thereby they aren’t only popular in private homes, but they were included in the permanent collections of museums like the Museum of Modern Art. Inspired by the classic furniture of Danish design, the past few years were the bed of new creatives like Form us with Love, Norm Architects and Claesson Koivisto Rune, adopting the quintessence of the ancient masters and adding a bit of modern coolness to them, transporting them into modernity. The New Danish Design connects a timeless shape with fresh colours and material accents. 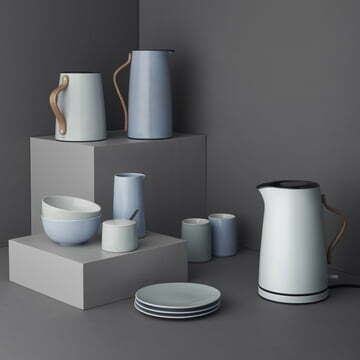 The traditional Danish company Stelton recognized the potential of the new Danish design and re-interpreted design classics, like the iconic stainless steel coffee maker by Arne Jacobsen in cooperation with young design talents in the collection “Danish Modern 2”. The result is the Emma Series (HolmbäckNordentoft 2013), which gave a new coating to the classic piece with the soft pastel blue colour and the material mixture of stainless steel and wood. Another representative of the “New Danish Modern” is the 1999 founded company Norman Copenhagen. The base for the history of success of the Danish design duo was done with the Norm69 lamp. Normann Copenhagen creates home accessories and furniture shining with trendy colours since 2009. 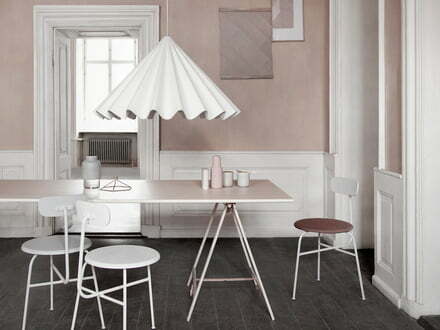 Normann Copenhagen combines timeless design with current colour trends of fashion and lifestyle fields. The young company Muuto also encouraged big changes in Danish design, being nabbed after the original Finnish word “muuto” , meaning “departure and “change”, being the core of the design philosophy of the manufacturer. The company calls young newcomers for the revitalization of the golden era of Scandinavian design and also established designers of Norway, Sweden, Finland and Denmark. Thereby the traditional handicraft comes together with innovative design ideas. The Copenhagen design company Menu produces home furniture and accessories out of new materials, with new functions and under different production conditions, with the demand of re-defining classic Danish design, calling it all New Minimalism. Thereby the Menu-Design convinces with the interplay of counterparts. A straight-lined and filigree shape comes together with distinctive materials like steel, concrete and marble. The New Danish Design connects tradition and innovation looking into its own history, becoming a modern design language. Young Scandinavian designers and established manufacturers connect contemporaneous colour and material trends for a sophisticated quality demand and for timeless shapes. Thereby the special closeness to nature of the Northern folks appears in the conscientiously treatment of natural resources. The typical characteristics of Danish design: minimalism, handicraft quality and functionalism meeting innovative concepts of modern lifestyles. A design, which breaks borderlines and which delights people in German living rooms with stylish colour accents. ferm Living Ferm Living is a Danish company, which specialises in the development and manufacturing of furnishing objects with a graphic touch. Hay The aim of the Danish design brand Hay is to bring the Danish furniture design of the fifties and sixties back to life. Instead of simply copying the old masters, Hay furniture wants to evolve the pieces in a modern, contemporary context. 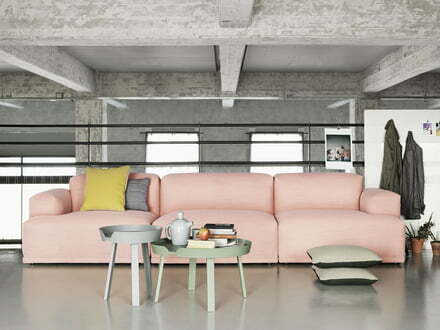 Muuto Muuto is a young Scandinavian company with the goal of reviving the golden era of Scandinavian design. They are working in collaboration with some of the best-known Nordic designers.